Until this Cherry Garcia Ice Cream found its way into my life, I had no idea vegan ice cream could taste so good. No lie. It has the most unbelievably creamy texture that can hold its own against any dairy-based ice cream. You'll notice that I didn't call this Vegan Cherry Garcia Ice Cream or Paleo Cherry Garcia Ice Cream. The thing is that this is just damn good ice cream. And ya, it does just so happen to be vegan and paleo, but who cares? This is all about crazy good ice cream, not about the labels. Creativity is a funny thing. So often when I have an idea for a new and totally awesome recipe I'll go online and Google it only to find out that a bazillion other people came up with the idea first. Nothing like jumping on the train long after it's left the station. That was the story with this Boozy Cherry Garcia Ice Cream; only it was me being super forgetful and thinking that the idea was mine and mine alone. The truth is that I first liked a picture of Traci, from Vanilla and Bean, pouring bourbon over some local cherries. Then I commented that Kristy gave me a jar of boozy cherries. Then I went onto like 2 Bourbon Soaked Cherry Vanilla Bean Ice Cream pics Traci posted to Instagram. And then finally I decided that it was my brilliant idea to put boozy cherries in ice cream. Ha! It's incredible how I can fool even myself. Ugh. Anyway, clearly I have to thank Vanilla and Bean and She Eats for the inspiration behind this Boozy Cherry Garcia Ice Cream. You ladies rock! If you're new to the world of vegan ice cream, let me let you in on a little secret ingredient: cashews. If you want your ice cream to have the same creamy texture of dairy-based ice cream, but without any of dairy, you want to reach for a bag of raw cashews. There's no other alternative that works as well. You'll want to soak the cashew for at least 4 hours, so they're super soft and blend easily. From there you can flavour it any way you like. For this recipe, I added bourbon, cherries, and some vanilla. You'll notice that there is coconut oil in the recipe too. That's there to make the ice cream extra creamy. Just like with regular ice cream, the higher the fat content, the creamier it is. If you make this Boozy Cherry Garcia Ice Cream, make sure to snap a pic and tag @theendlessmeal on Instagram so I can like and comment on your photos! 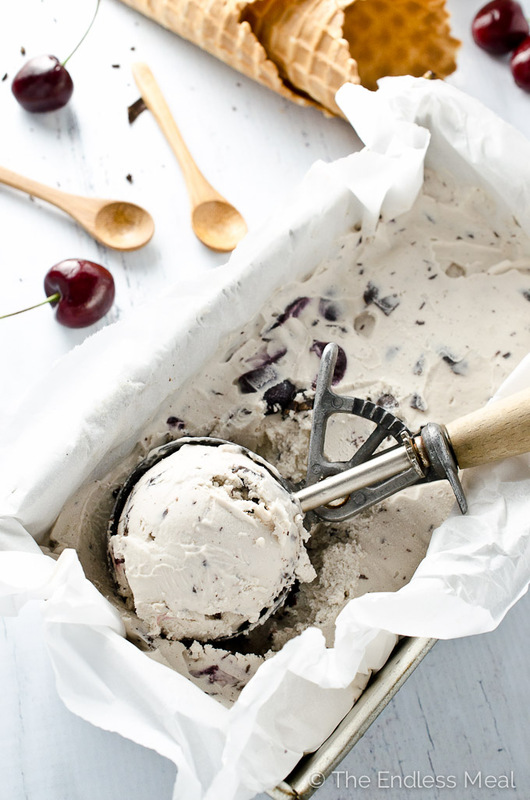 This Cherry Garcia Ice Cream is made even better that the real thing with a splash of bourbon. You would never guess that it's vegan + paleo too! Drain and rinse the soaked cashews. Add the cashews and all the remaining ingredients to a blender or food processor EXCEPT the chocolate and cherries and blend on high until smooth, about 3 minutes. Pour the cream into a bowl and refrigerate until completely cold. Once the cream is cold process it in your ice cream maker according to the manufacturers directions. 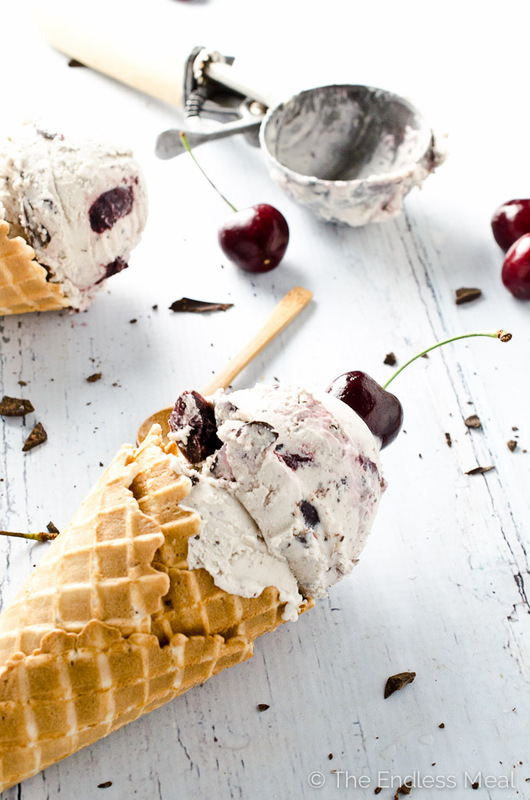 Once the ice cream resembles soft serve stir through the chocolate and cherries. 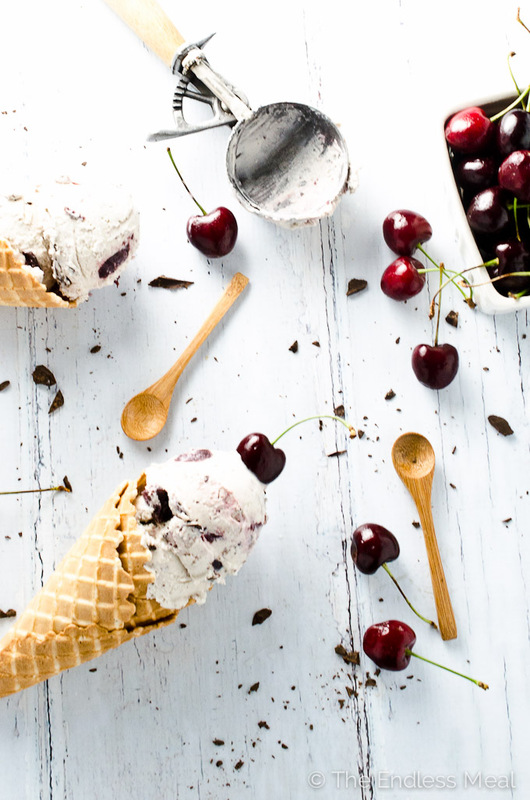 Scoop the ice cream into a freezer-proof container and press parchment or wax paper directly onto the surface of the ice cream. Freeze until solid. My first thought was to soak them in a little vanilla extract but, of course, that has alcohol in it, too. You could just put the cherries in as they are. It will be great! Just so you know… there’s no such thing as strict vegan. It’s either vegan or not. H8ney is not vegan. Thank you so much for your comment. I actually know a number of vegans who eat honey so I know it’s one of the only grey areas in veganism. The vegans I know feel ok with eating honey since no animals are harmed in its production, even though it is obviously an animal product. Ha-ha , that happens often to me when I came out with another ‘awesome idea’ and want to find the proof I’m a fabulous recipe developer:) Unfortunately, most things have already been created, but we just don’t know about them! But who cares indeed. Especially when it comes to such an amazing ice cream, right? Good job, Kristen! Ha ha I love it … “proof that I’m a fabulous recipe developer” … that’s totally it! Wowzas! That gives “real” ice cream a run for its money. Looks divine and I love your blog. You had me cracking up! Just when I think I’ve come up with something brilliant and original, I find out I’m just the last one to the party. Wah, wah. Totally original or not, I’m giving credit to you – this is the first place I’ve seen this! 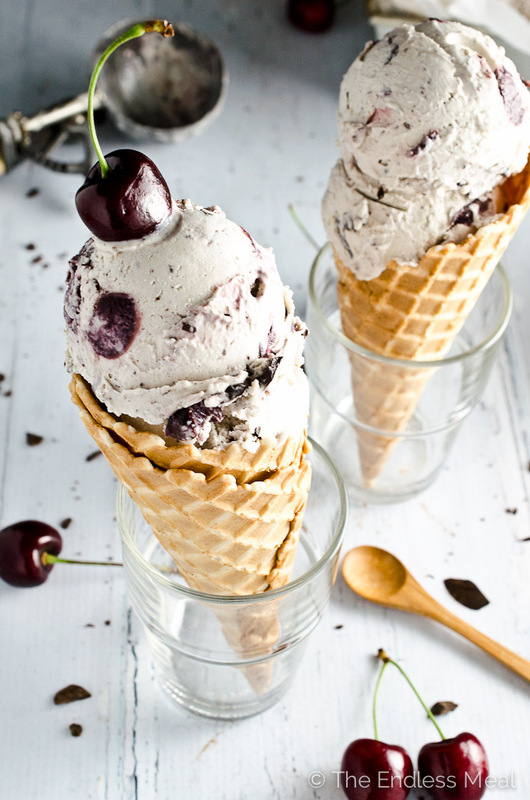 🙂 Perfect for the summer and Cherry Garcia is one of my favs – add a little booze and now you’re talkin’! 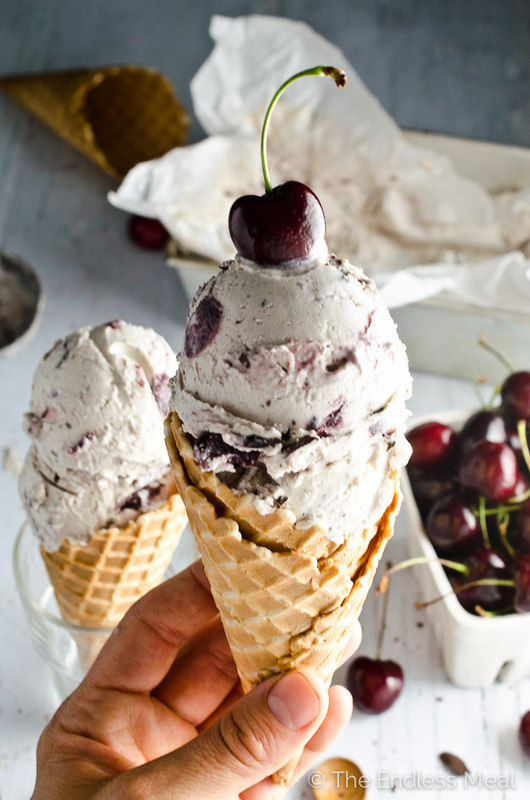 I made a bourbon cherry ice cream last summer and it was INCREDIBLE (like I wanted to eat it all straight from the ice cream machine and not share with anybody else). I’ve never made a nut-based ice cream like this so I’m going to bookmark it for later because my tummy is telling that I have to try it! Oh, yes! Ha! That’s exactly how I felt when I made this!! Absolutely perfect! I love the cashew base and…boozy 😉 Awesome!